INNOVATION AND QUALITY. THAT’S HOW HUSTLER®CHANGED EVERYTHING. Since then, Hustler® has become one of the leading brands of outdoor power equipment. Across the globe, the Hustler®brand signifies innovation, strength, performance and superior customer care. In addition to manufacturing best-in-class outdoor power equipment, Hustler® is committed to providing a quality owner experience. Our mission is to provide the most dependable, useful, and timesaving products in turf care, while maintaining unmatched customer loyalty and the best warranties in the business. Hustler's experienced dealers—including more than 1,600 U.S. dealers and over 30 distributors worldwide—are always ready to answer questions and provide expert service to every customer. At Hustler®, we design our mowers to be best-in-class. 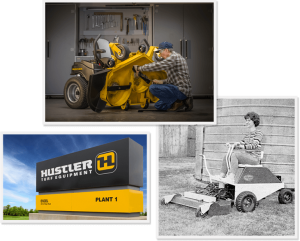 Hustler® is committed to providing mowers with strength, performance and dependability—and it starts with innovation. 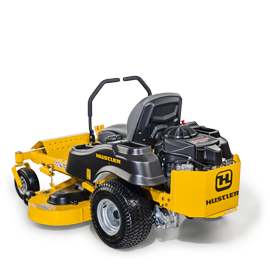 Hustler®'s innovative SmoothTrak™ steering sets the standard with zero-turn mowers. Our patented park brake system automatically engages when you open the steering levers. And our Raptor® Flip-Up is the only mower on the market with patent pending QuickFlip™ technology. 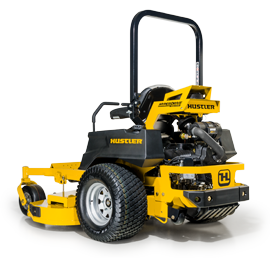 These innovative features, along with heavy-duty, welded steel decks and commercial-grade performance, make Hustler® zero-turns the best residential mowers on the market. Since Hustler® introduced the very first zero-turn mower in 1964, we've been working at making the best even better. Our line of commercial-grade zero-turn lawn mowers come fully equipped with our patented park brake system, SmoothTrak™ steering and all the innovation you have to come know and expect from us. All-American quality, strength and performance – that's the Hustler® way.